When watching a live basketball game, one of the frustrations fans face is not knowing the on-going stats for individual players who are not in the game or who are waiting at the scorer's table to enter the game (unless of course they have a wireless device). 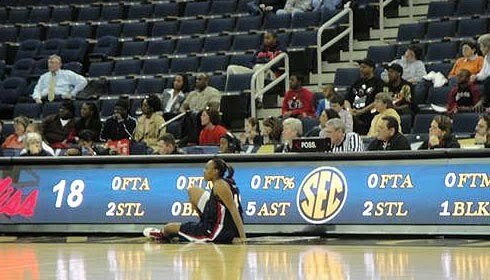 At this week's 2010 Southeastern Conference (SEC) Women's Basketball Tournament at the Gwinnett Arena in Duluth, GA, there is an interesting solution: display the stats on the scorer's table video display. Unfortunately, this is only a 25% solution at best. You Want Numbers? : One of the features at this weekend's SEC Women's Basketball Tournament at Gwinnett Arena in Duluth, GA is a heads up display of a player's stats while they wait to enter game. Photograph courtesy of the Southeastern Conference. The assumption hear is that the stats are not being displayed at the same time on the small video displays that ring the arena in between the red seats and the yellow seats. 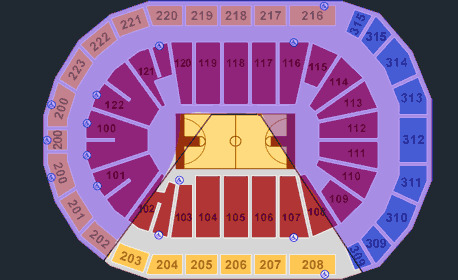 This is a question I will have to ask somebody in attendance at the arena. 2. It may not be very effective if there are multiple subs from one or both teams waiting and they are blocking the display. So yes, this is a "cool" use of networked technology. But is it a practical use and value if it is only 25% effective?